This is a recount of my drive from Franz Josef to Queenstown on New Zealand’s South Island along one of the most spectacular stretches of road I’ve come across to date. I set off on my road trip around New Zealand’s South Island first driving from Christchurch to Marlborough, then across to the Wild West Coast. From there I made our way south to Glacier Country. The whole drive to this point was nothing short of spectacular with so many incredible places to stop along the way. I was so impressed with what I had seen in New Zealand up to that point that I thought how could it possibly get any better. The next leg, the drive from Franz Josef to Queenstown, absolutely blew my mind. Around every corner and over ever mountain range my eyes were spoilt with so many awe inspiring views that I was left utterly gobsmacked when I pulled into Queenstown. The drive takes you out of Glacier Country winding through lush forest and eventually back to the coast at Haast before catapulting you into the mountains and over one of the most treacherous (and spectacular) passes, the Haast Pass, on the South Island. The mountain spits you out the other end at the north of Lake Wanaka where the drive takes you along the lake, switching to Lake Hawea half way along and then into the Wanaka township. From there you have two route choices. Option one, you can drive along the Crown Range. This is the quickest of the two routes and provides awe inspiring views along this winding mountain road. However, the road is not for the faint hearted. It might start off pretty tame but the switch backs as you come down towards Queenstown had me closing my eyes (don’t worry, I wasn’t the driver!). This brings you out near the lovely Arrowtown where it’s just a short drive into Queenstown. Option two is the longer route and takes you through the fertile plains of Otago which are full of vineyards, orchids and some pretty special views of the surrounding mountains. 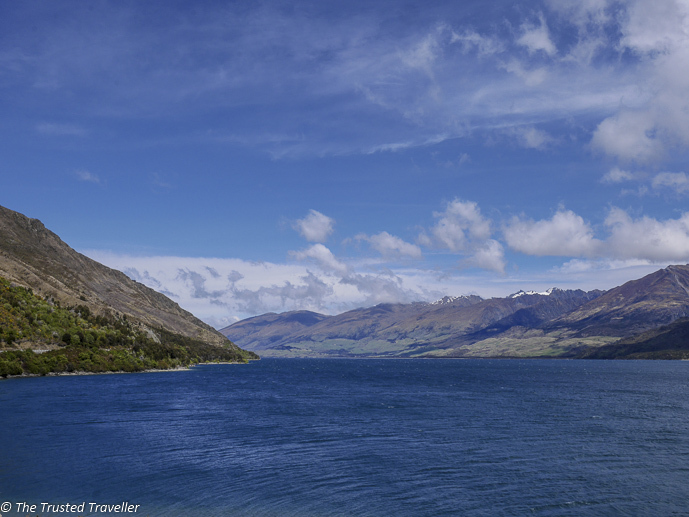 The drive follows Lake Dunstan’s full length and then cuts back through the Gibston Valley to Queenstown. There is so much to see on the drive form Franz Josef to Queenstown that I recommend you take at least a full day to explore, if not more. I did it over two days with a few nights in amazing Wanaka in between. 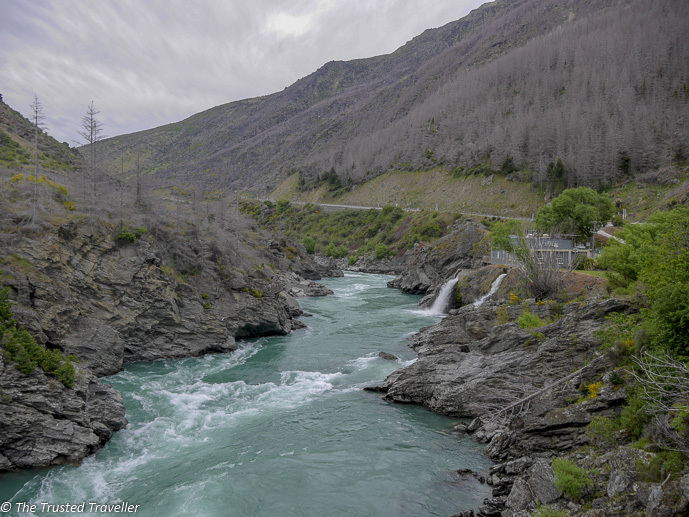 Here are some of the must see stops along the drive from Franz Josef to Queenstown. All stops are well sign posted along the main highway. 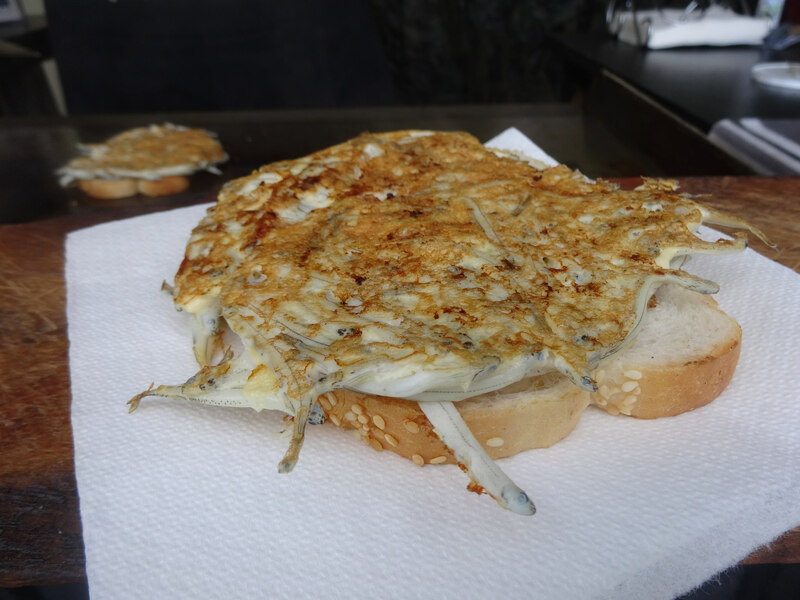 When you’re on the West Coast of New Zealand, whitebait is one food you absolutely must try. And the best place to do that is the Curly Tree Whitebait Company on the Haast Hwy just over the bridge that crosses the Waita River. One of New Zealand’s delicacies, whitebait is a tiny fish, usually around 25-50 millimeters in length, that is generally made into patties and fried then served between two piece of fresh white bread. Don’t be put off by the dozens of eyes looking up at you as you eat, they are delicious! 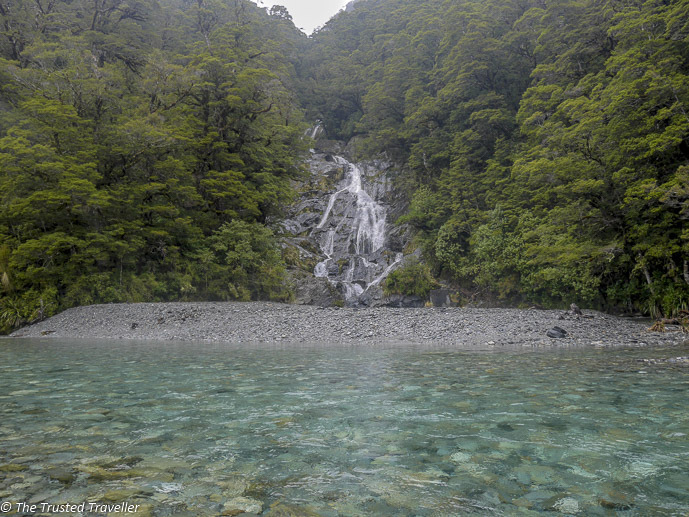 Just a 5 minute walk from the road you’ll find the Fantail falls, one of the closest falls to the road on the Haast Pass. The falls are 15 metres tall and get their name because in spring time when there is snow melting above, the falls look like a fan. An easy 15 minute walk on a gravel path through the forest will take you to the Blue Pools. 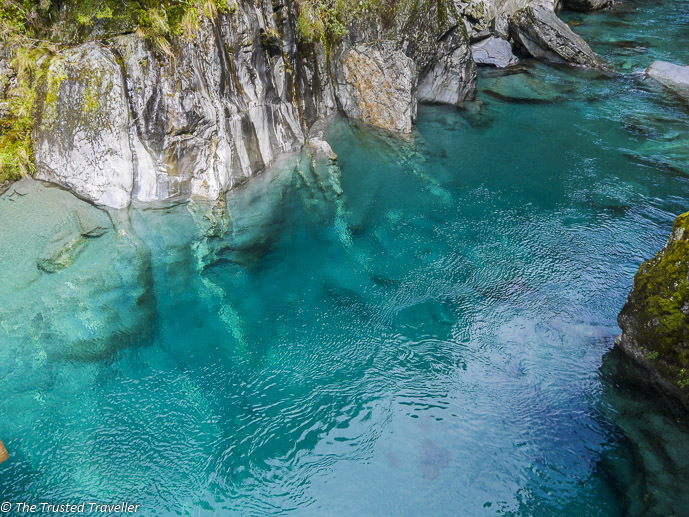 These crystal clear pools appear to be a bright blueish green colour and are fed by the surrounding glaciers. During autumn and winter, large rainbow and brown trout migrate up the Makarora River from Lake Wanaka, and can often be seen swimming in the pools. To protect the environment here, fishing is not allowed. There are a bunch of longer walks you can do from here too, if you have the time. As you come out of the Haast Pass the landscape opens up at Makarora and the Makarora River which feeds straight into the northern end of Lake Wanaka. There are lots of safe spots to stop along the lake for photo ops or to just get out and admire the spectacular views. About half way along Lake Wanaka the road passes over a small ridge and you are straight away driving along Lake Hawea. Make sure you stop off at The Neck, a lookout point just after you pass over the ridge (photo above) which offers some of the best lakeside views in New Zealand. 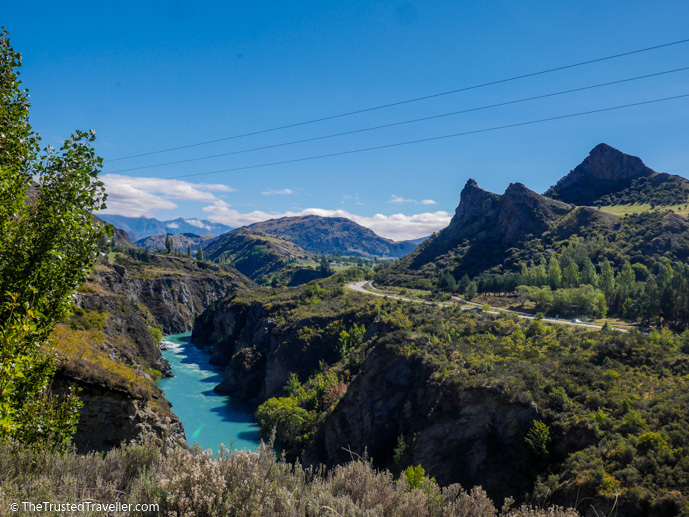 And as with Lake Wanaka, there are plenty of safe spots to stop along Lake Hawea as you drive almost the entire length to the township of the same name. If you’re splitting this trip into two or more days, then Wanaka is the perfect place to stay for a night or two. Located at the southern end of the lake of the same name, Wanaka is a small but thriving little town and there is lots to see in the area. 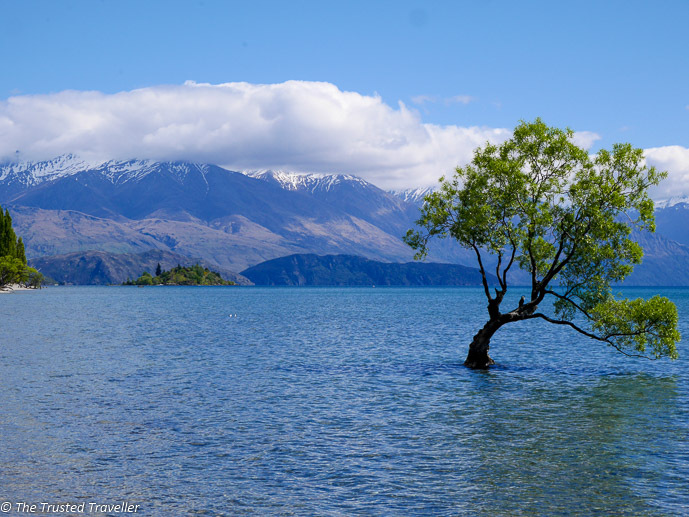 Take a walk around the lake, check out the famous “Wanaka Tree”, set off on some of the most popular hikes in New Zealand or in winter go skiing at the nearby ski fields. The surroundings of Wanaka are picture perfect, I dare you not to fall in love with it just like I did. Found on the option one route mentioned above, this charming little township dates back to the gold rush days in 1865. 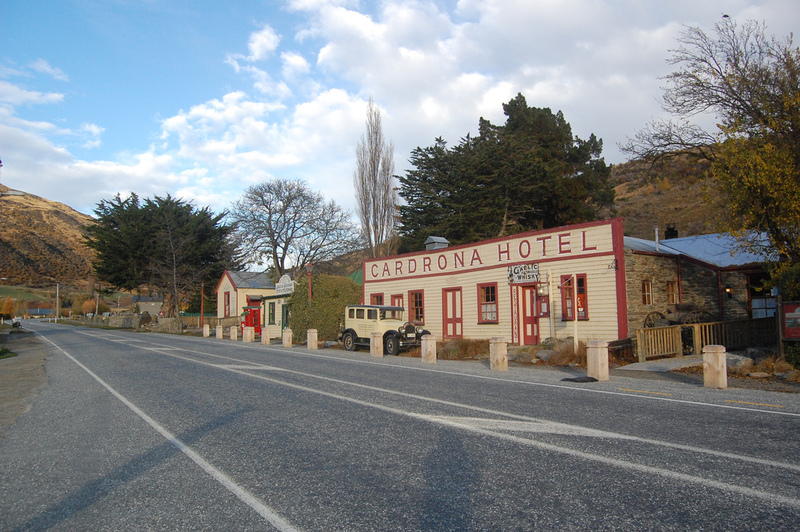 Take a wander through the town and stop off at the Cardrona Historic Hotel for a bite to eat and browse through the collection of items on display that date back to the areas early days. On the edge the Kawarau River in Cronwell is the Old Cromwell Town Historic Precinct (this can be found on route option two). The buildings you see here were relocated from other parts of Cromwell to best preserve the areas rich history. 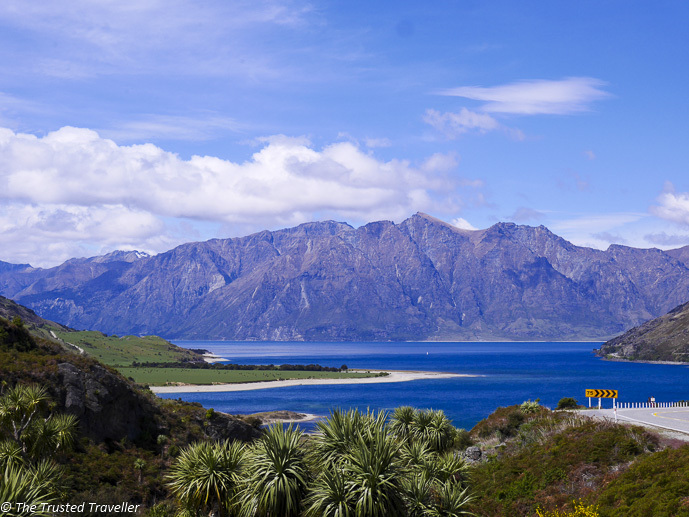 It’s a nice place to stop for a wander and soak up the history or just to enjoy the views over stunning Lake Dunstan. The Gibbston Valley is just one part of the Otago Wine Region famous for its cool climate wines the world over. There are lots of vineyards and wineries scattered through the valley clinging to the steep cliffs. The most notable winery is the Gibbston Valley Winery which has a wine cellar and tasting in a cave that has been carved out of the rock face. Stop by the lookout (on route option two) here for great views of the raging river below and of the miniature power station built in 1936 called Roaring Meg. It’s a very atmospheric spot in the valley with tall mountains looming above on either side of the river. At different times of the year, the colours of the trees around will change colour making this a great stop even this isn’t your first visit. 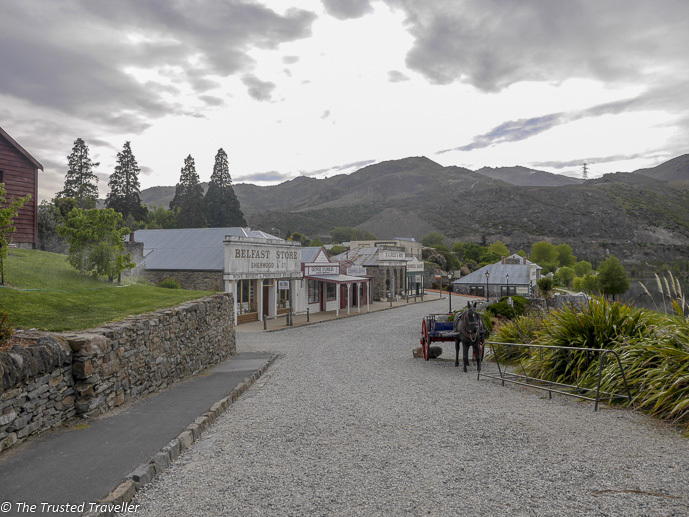 Honestly one of the most quaint little towns I’ve been to anywhere in the world, Arrowtown, is the best preserved gold mining town in Central Otago. There is plenty to see here. Take a walk down the main street past the old gold miners cottages; make a stop at one of the many cafes through town; explore the Chinese Settlement which was first settled by the Chinese miners in 1866; or head down to the river for a longer walk. The town can get a little busy in the middle of the day so try visiting early or late in the day. If you choose to split this journey into two or more days as suggested above, these are a few great options for accommodation in Wanaka to suit all budgets and comfort levels. This hostel features an open-plan lounge/dining area with log fire and views of the Alps and lake. Choose to stay in lively a dormitory or in the comfort of your own private room with en-suite. Lakeside accommodation with views of the mountains just minutes’ walk to the town centre. All rooms feature under-floor-heating, en suite bathroom, a lounge area and cooking facilities. Just 5 minutes’ from the town centre. Facilities include spa, lounge and a large patio overlooking the mountains. Handmade wooden furniture and rich colourful decor make all accommodation a special place. 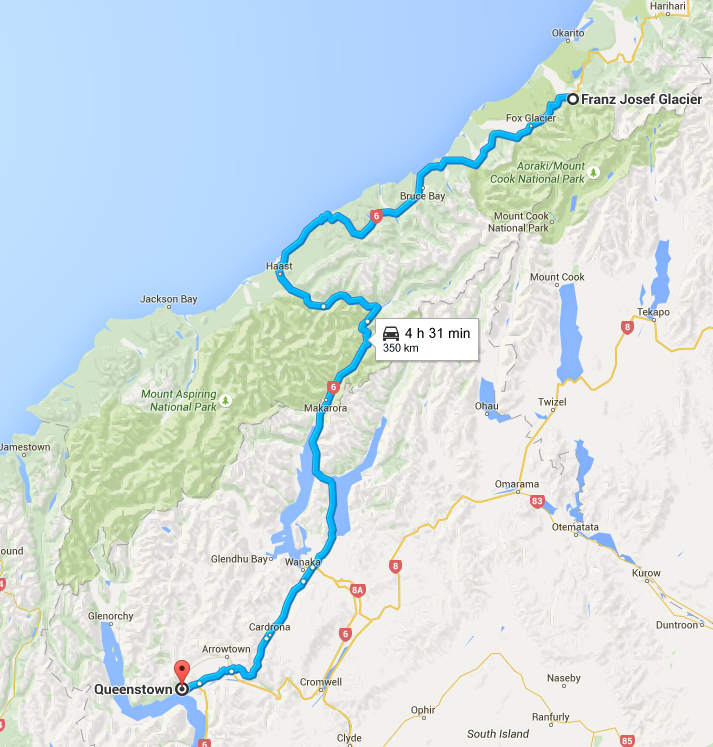 Which stop on the drive from Franz Josef to Queenstown are you most interested in? great memories of my trip there – love the photos! In Fran’s Josef I spent two days there – was able to kayak on the lake and take a helicopter to hike on the glacier before a much needed massage. Gorgeous part of the world. Suggest you add Doubtful sound to your itinerary as less crowded than Milford and is worth the journey – have fun! Thanks Suzanne. Glad you enjoyed your time there. I’d love to visit Doubtful Sound someday. I think we will do this Franz Josef to Queenstown road trip exactly as you have described. You have done an amazing job in giving us all of the details and the maps. I love the photos and how beautiful it all is. Looking forward to the next one. Thanks Paula. I hope you guys enjoy the drive as much as we did. It is truly one of the most spectacular places on earth. What a beautiful road trip, such amazing photographs. This country is very high on my bucket list. We made it to Australia in 2014 but just did not have enough time to go that one step further. Your post is inspiring me to work this into my schedule asap. Thanks Sue. I hope you do make it to NZ sometime soon. How did you enjoy Australia? From the color of the water to the snow-capped mountains, it’s a dreamland. Stunning photos! Thanks Lesley. It certainly is. The photos (here and on the other blog post) drive me crazy! Makes me want to book a flight ticket to NZ right away! By the way. 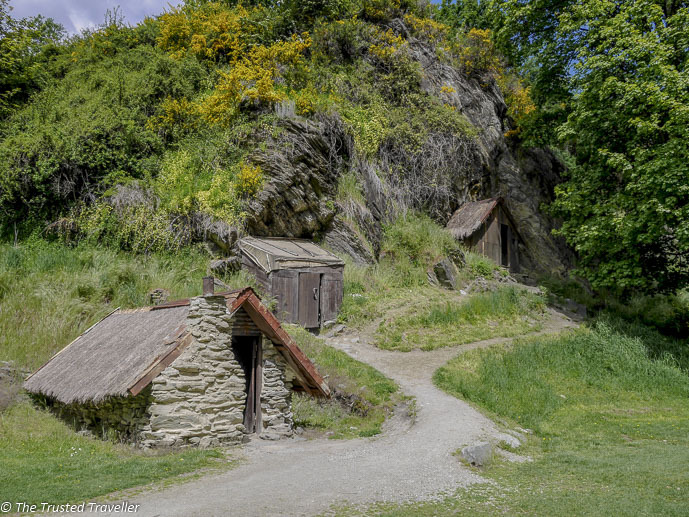 interesting about the Chinese Settlement area in Arrowtown. That’s something different too, for me. So glad to have inspired you and I do hope you get to NZ someday soon. It is such a stunning part of the world! This is a great post, the photography is beautiful! I hope to make this trip sometime, I’ve only done from Christchurch to Queenstown and while what I saw was awesome, your post has made me realise there is a great deal we missed! Thanks Michelle. For a small country, NZ certainly has lots to see. You are absolutely right, that drive is stunning; I especially love the Roaring Meg! I would love to take a road trip again myself, I have not done one in a few years. Road tripping is my favourite way to travel. If I could do it all the time I would. Hope you get to have your road trip soon! New Zealand is more and more intriguing to me, I really hope to visit it in next few years as the scenery is just breathtaking there! And now you made me dream of it even more! When I finally go I will make sure to do the road trip like yours, it seems like a highlight of NZ! Thanks Kami. It is an insanely beautiful part of the world. This journey sounds AMAZING Jen! Thanks for sharing the route with us – trying to organize a NZ trip for late this year or early next so I’m looking at all different options, though thinking a road trip will end up being the way. Your photos are stunning – and I can’t wait to get to the blue pools for myself. The whole scenery reminds me a lot of Alaska actually – super stunning! Thanks Meg. Glad to hear you found this useful and hope you enjoy your trip to NZ too. Looking forward to visiting Alaska myself one day as I have been hearing from so many people how it is just a beautiful as NZ. Feel free to email me if you have any questions when planning your trip! i love road trips! Haven’t done one in NZ, but I have a bunch of ideas when I do! Thanks! For this trip and every other trip we have taken in NZ we use Europcar. I’ve never heard of any hire car company restricting where you can drive it so would be interested to know more about this. Was there a particular section of the road they all said you couldn’t drive on? I am inspired by your posts and photo and plan to hit the road this Nov with my husband. 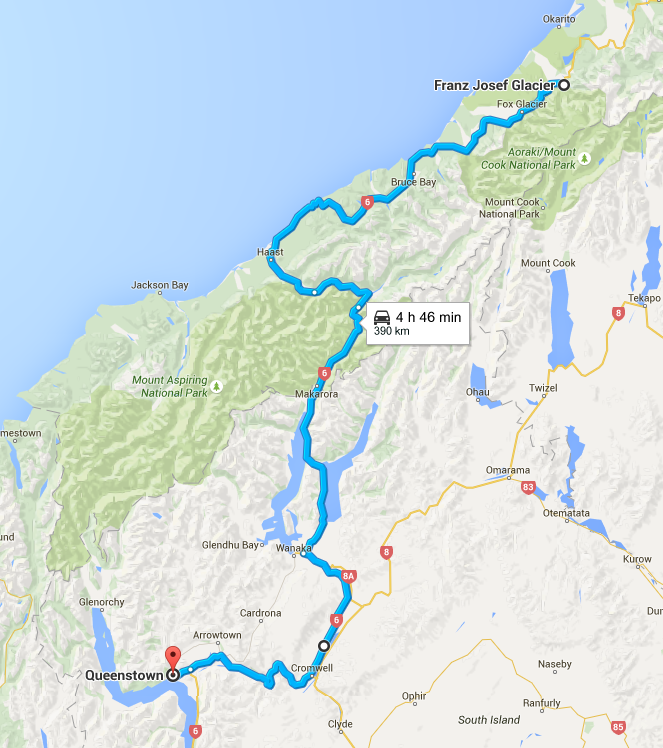 On day 4 of our trip, we plan to drive from Franz Josef to Queenstown, and stay in Queenstown for the next 2 days. Some people say we are too ambitious. What is your advice? 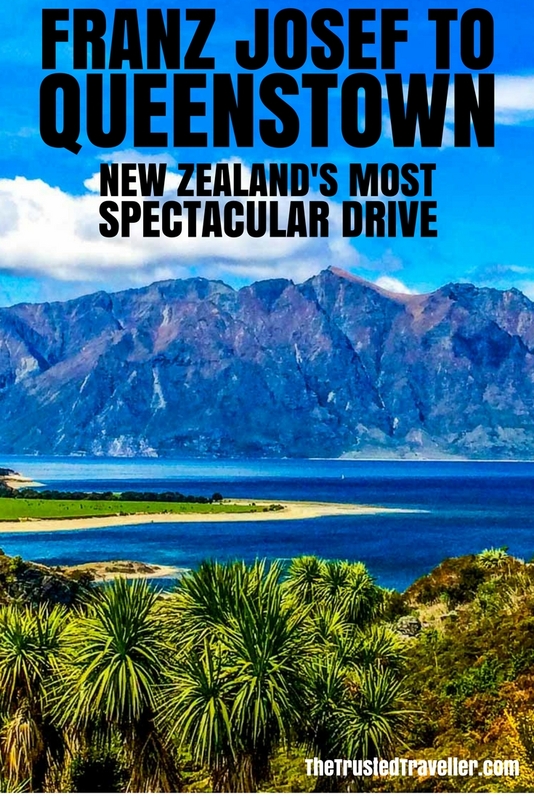 I definitely don’t think that drive is too ambitious and 2 days is just enough time to see the highlights of Queenstown. Of course more time will allow you to see more. Hope you and your husband have an amazing time, it is an incredible part of the world! We are taking a cruise that sails from Auckland, and stops in Tauranga, Wellington, Picton, Kaikoura (Christchurch), Oban and Milford Sound. Then the ship sails to Australia. Now we realize that we will not be able to see the most scenic part of the South Island. Hence we are thinking flying back. Because we have only 1 week- here’s our proposed schedule. Christchurch 1 day, Tekapo 1 day, Mt Cook Village 2 days, Wanaka and Haast 1 day, Queentown 1 day and Doubtful Sound 1 day – your thoughts? Happy to help. I think it is a good itinerary but maybe a bit much for a week. You would be spending the majority of the time driving with little time to stop and see things in the places you mention. Doubtful Sound only runs two day overnight trips so 1 day to visit that is not possible. I would suggest cutting it down to 2 or 3 places, maybe fly into Queenstown and base yourself there for the week instead. You can visit Wanaka and Haast on a day trip and there is so much to see and do around Queenstown, you could easily fill the week. Otherwise I suggest Queenstown, Tekapo and Christchurch. It is a good driving route you will be left with time to see the places you visit, rather than just having time to drive through. Sorry, this probably isn’t the answer you were hoping for, but from my experience, this is way too much to try to fit into a week and make it enjoyable. Hope you enjoy the cruise and your visit to Australia (my home)! Thank you, Jen. Since we will be at Milford Sound during the cruise, may be we can skip Doubtful Sound which is a bit out of the way although a tour operator do offer a one-day (14 hr) round trip from Queenstown. I haven’t been to Doubtful Sound but from the pictures I have seen, it looks much the same as Milford Sound. So skipping it in favour of spending more time elsewhere makes sense for your limited amount of time. Hope you enjoy NZ as much as I did. What a beautiful post and certainly very inspiring. We plan to drive from Franz Joseph to Queens town last week of February 2018. 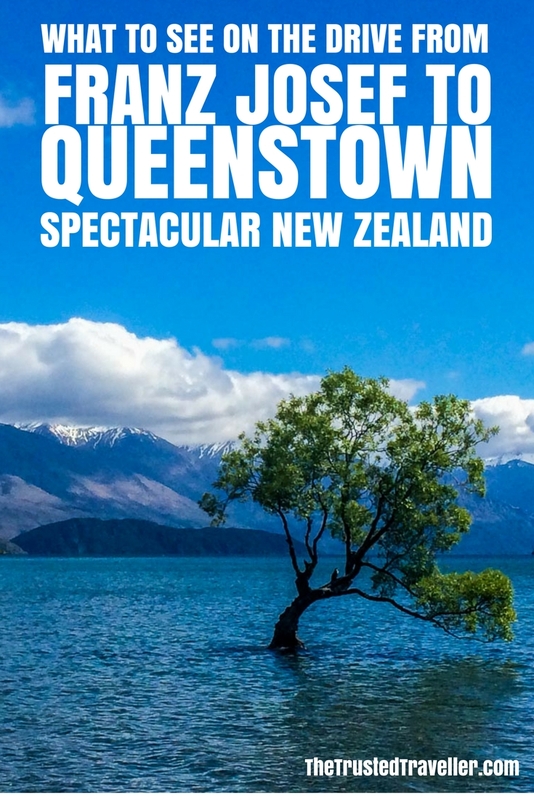 We will stay in Queens town for three days and fly back to Auckland. When I look at Google maps it shows tons of road closures on Hwy 6. Is this normal? If so, are there any detour signs or alternate road advisory posted? I am worried having to get stuck on the road for a long time and not know what to do. That road is prone to landslides so it does get closed from time to time. Sometimes it will be closed for a short time (30 minutes or less) while they do a quick fix. In this case you can just wait before continuing through. Other times the road may be closed altogether and there will be signs in place with suggested detours. I’ve driven through there many times and only every had one minor delay because of a landslide. It is a very popular road to drive so you won’t be the only one around. Awesome and good to know. Thank you so much, Jen. How long did it take you to do this drive given all the stops you made? We are trying to decide between taking the InterCity bus vs. a rental car from Queenstown to Franz Josef…what would you suggest? Keep in mind that we will be visiting from the US and drive on the right side of the road here. 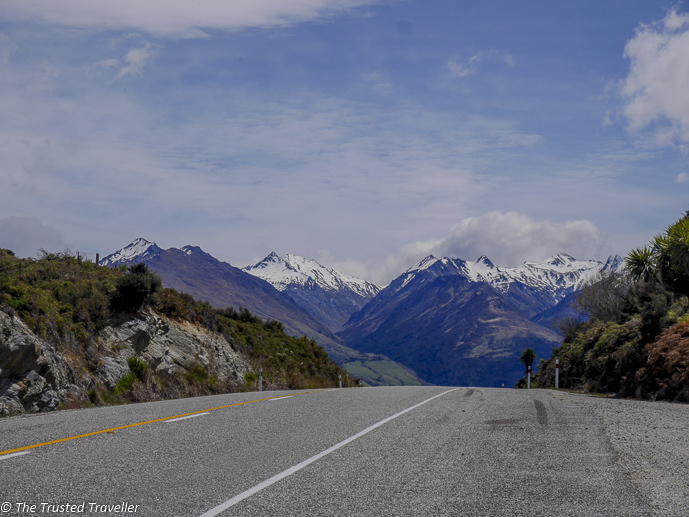 This drive was done over two days with an overnight stop in Wanaka. You could easily do it in one day though. I highly recommend driving. On the bus you will not be able to stop at any of the places I mentioned in this post. You will have more freedom. The road are good, just stick to the rules and you will be fine. Hi, just planning a south island trip and it feels like i want to stay forever!!! although i think i´ll take all of your advises on this route, i have two questions so far. 1. i’m doubtful whether or not taking the tranzalpine. is it “worth it” after attempting this road trip? 2. is it safe to do to a day trip to milford sound on your own by car or would you rather rent a tour to do it? thanks so much this blog rocks! I know how you feel about wanting to stay forever, wait til you visit then you will never want to leave!!!!! Personally, I haven’t been on the tranzalpine. But if you have time and it is something you want to do, then I say go for it. You never know if something will be worth it until you give it a go. What time of year are you travelling to Milford? If it is in the middle of summer the roads will be easier to drive on, but outside of that they can get very icy very quickly. I wouldn’t say it is unsafe in anyway, just that it isn’t for everyone. I really enjoyed taking a tour because no one in your travelling party has to drive, meaning that everyone can sit back relax and enjoy the view. I hope you have a great trip and don’t hesitate to ask more questions. Would you recommend doing that scary drive in a camper van? Or Should we rather take your option 2? Lots of campervans on the road so nothing to be worried about. Just stick to the speed limit and follow the road rules and you will have no problems.